Happy Memorial Day! We want to say a huge thank you to all the men and women who have given their lives for our freedom. I hope you are enjoying some time off, a cook out, and family time. Over the weekend, J and I made a craft for Memorial Day. It is super easy, and you probably already have the supplies at home. I printed out the letters U, S, and A (font size 400) on card stock. I also printed out some small stars and one large star for J to color. He was excited to use the markers. 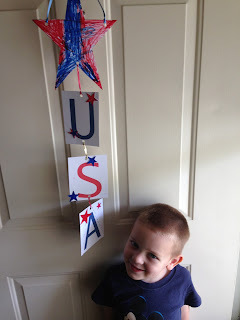 After he was done getting marker on himself and the stars, I cut them out and we taped the small stars to the letters. I used a hole punch to put holes in the card stock to connect the letters and the large star together with ribbon. We have had some rain over the weekend so the card stock began to curl a little from the moisture. 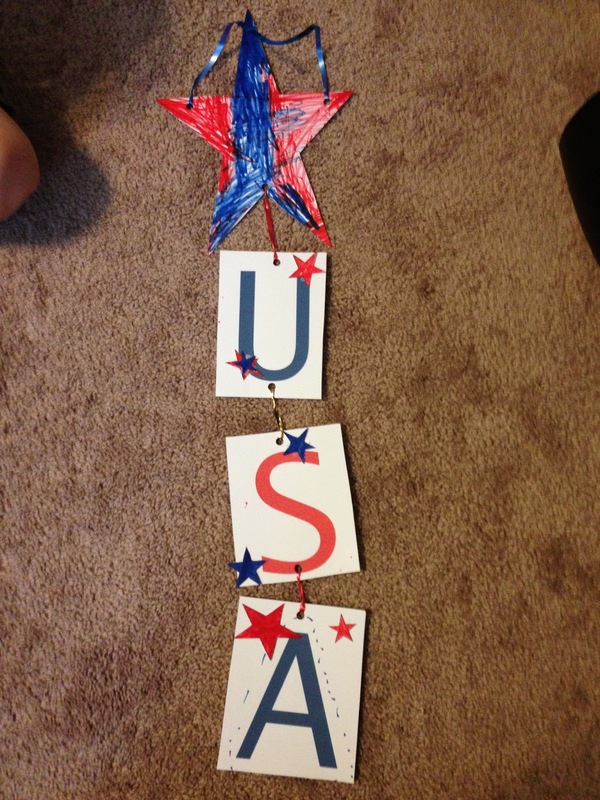 You could glue the card stock letters and star to card board to keep from curling. It was a fun craft that only took a few supplies. 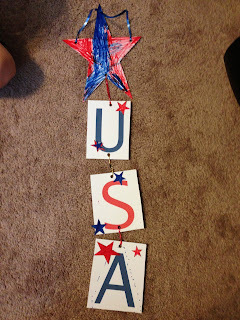 I modified this craft from Preschool Crafts for Kids to the supplies that I have at home. Have a safe and lovely holiday!